If you don't live in the area, chances are you wouldn't know that Gohan even exists. Hidden within residential towers in Brentwood, it's not a restaurant that many people will randomly visit. Having driven by it many times myself, I was quite curious since it advertises to be a fusion Japanese restaurant. Now, fusion can mean one of two things. It can imply that the food is prepared in a way that incorporates different cuisines and ingredients. Or... it can just be an excuse to serve food which is neither good or authentic. So you can imagine my apprehension. However, after seeing Jessica's tweet about the place, I decided it was time to try it out. I had promised to give her a shout when I did; but today's visit was a bit random and there was not time to contact her (she forgave me though!). Coming straight from the kiddie's music class, we were all quite hungry, especially since we didn't eat breakfast! Missing a meal... how tragic. I was lucky to get a parking space right in front. As I was inserting money into the meter, I noticed that it suddenly was not adding any more time. DOH! There is a 30 minute limit and I put in a Loonie too much! Arghhh... Honestly, how can 30 minutes be enough? Well, there is the Chinese in me taking over. What could've I done with that Loonie... It could buy me 2 samosas! Darn! Alright, getting over the sting of losing money, we got down to ordering. 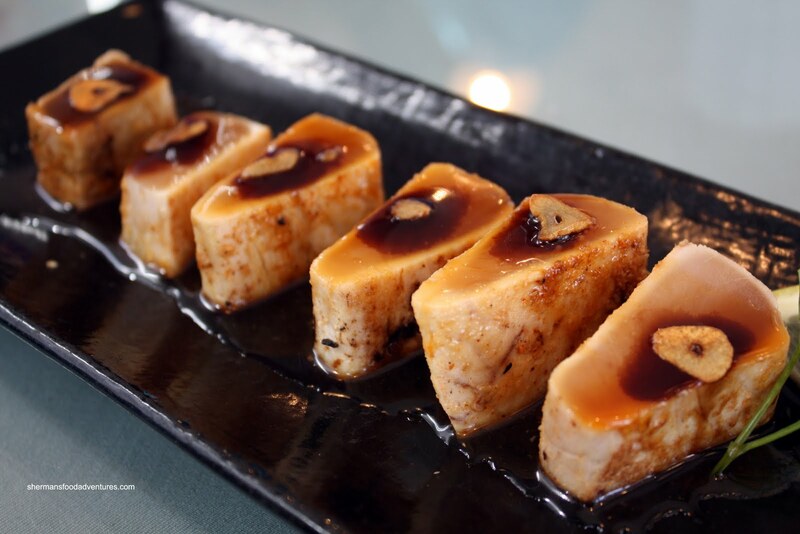 Viv set her sights on the Garlic Tuna Tataki to start. Unlike most other versions I've seen of this dish, the tuna arrived in big chunks on a long plate. Topped with a fried garlic chip and drizzled with vinaigrette, the tuna was a delight to eat. However, since they were in such big chunks, the tuna was a bit stiff. That detracted slightly from the texture. Wanting to try a specialty roll, she also ordered the Deluxe Holiday Roll. 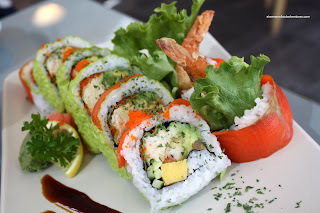 It consisted of tamago, cucumber, imitation crab, scallop, avocado, ebi tempura, romaine lettuce and tobiko on the inside while smoked salmon, soy wrap and more tobiko resided on the outside. For $7.25, this was a very good deal. The roll was massive and Viv watched in disgust as I stuffed whole pieces in my mouth. Nothing really stood out in this roll other than the smoked salmon; yet it was pleasant to eat and I'd order it again just for the value. Personally, I wanted a good variety of items and usually a combo will do the trick. 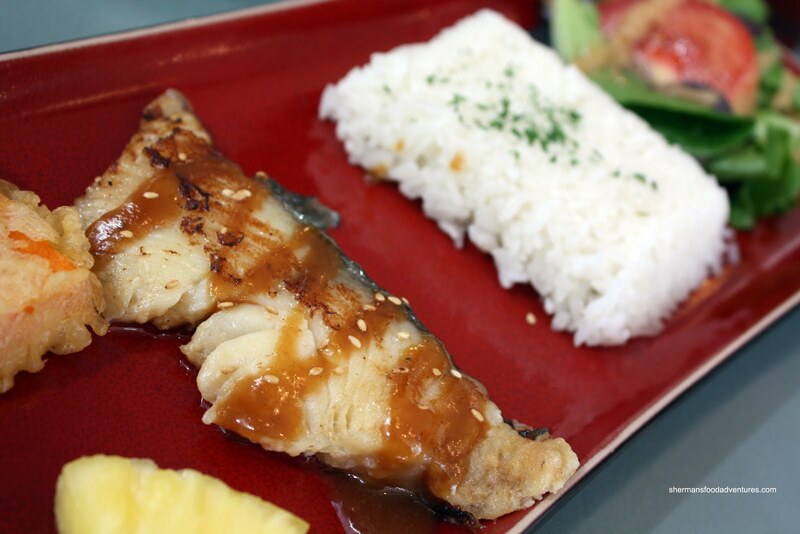 However, in most Japanese restaurants, the bento boxes or combinations seemed to be over-represented with California rolls, teriyaki chicken and the sort. Hey, those items are fine and dandy; but for me at least, they are too boring. I do realize that the rationale behind it - to cater to the masses. So imagine my surprise when the combos here offered a choice between a California roll or nigiri sushi. Furthermore, the choice between black cod, unagi, ginger pork or teriyaki chicken was a real surprise. Hey, I'm all over the black cod! So all this choice can be found in the Deluxe Lunch Combo for $12.95. 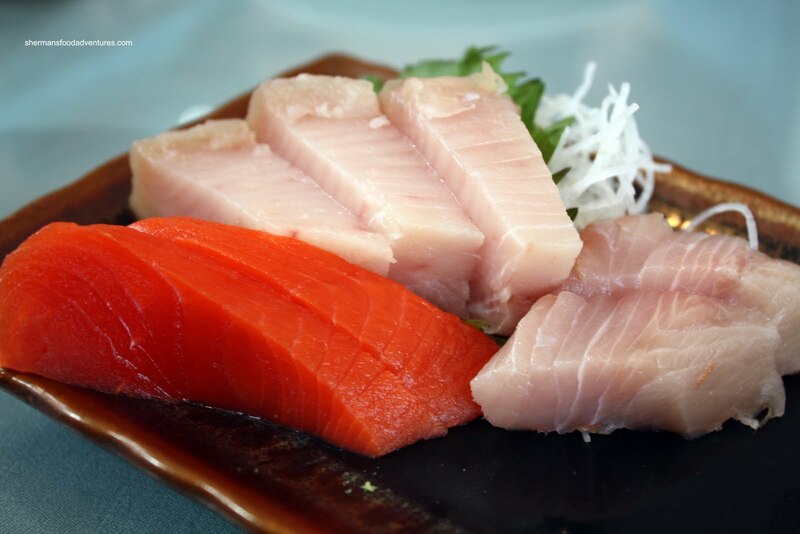 It includes the requisite miso Soup, green salad and rice with Tuna, Salmon and Tai Sashimi. 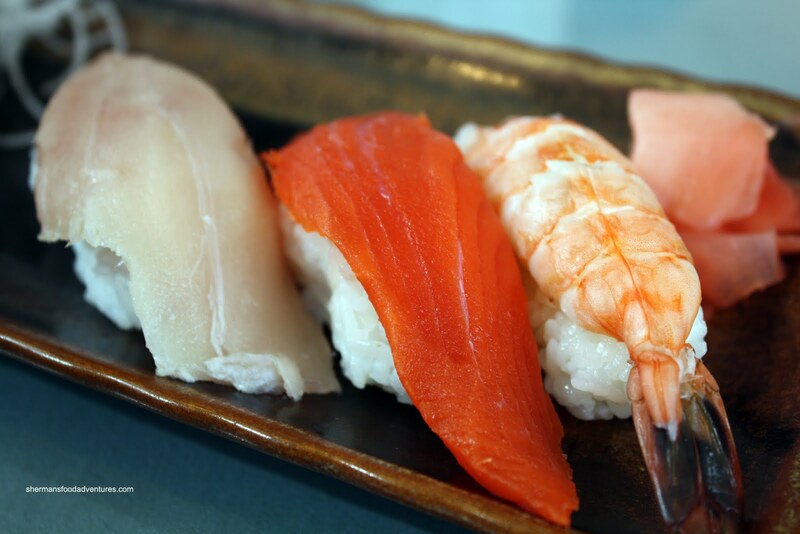 I chose to go with the Ebi, Tuna and Salmon Nigiri and the Miso Black Cod. As you can see in the picture, the fish exhibits a nice fresh sheen and I even more happy to see wild salmon (not sure why the Tai was cut in big chunks though). Of course the nigiri was plenty fresh too and I found the sushi rice to be quite decent - slightly dry while still exhibiting good "bite". Normally, when we order miso black cod at any Japanese restaurant, it would cost at least $7.00 by itself. I thought the inclusion of this expensive fish as an excellent value. It was prepared perfect being moist, flaky and melt-in-your mouth goodness. I know it's just plain rice; but I need to mention it was also very good. One very minor issue. They used spring mix for the green salad which I find doesn't hold up well to the ginger salad dressing (regular iceberg mix would be better with more crunch). 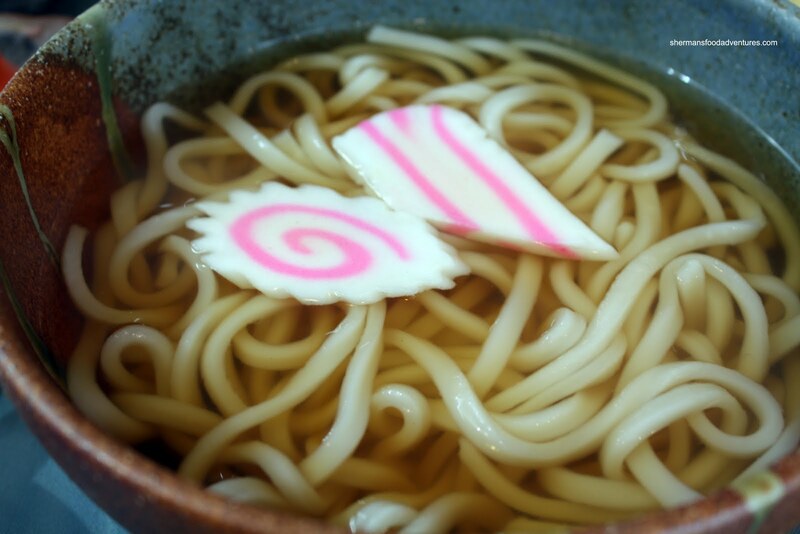 Of course, for the kiddies, here comes the Tempura Udon once again. Although the tempura itself was crispy and only slightly oily, the inside portion of the batter was slightly gooey making it a tad heavy. As for the udon, it was not overcooked and the broth was flavourful without being salty. Honestly, I wasn't expecting anything on this visit to Gohan. However, we were pleasantly surprised at the level of execution and quality of the food. It isn't necessarily the cheapest option around (especially with Sushi Garden and Miki nearby); but for me at least, the extra cost is well worth it. Will have to admit, these actually looks quite good. Alas, as you mentioned, the tataki should have been cut thinner. It looks like one of those pieces could easily be sliced into two, heck, even three slices and still it would have been good! BTW, didn't Sushi Garden also open a location nearby? 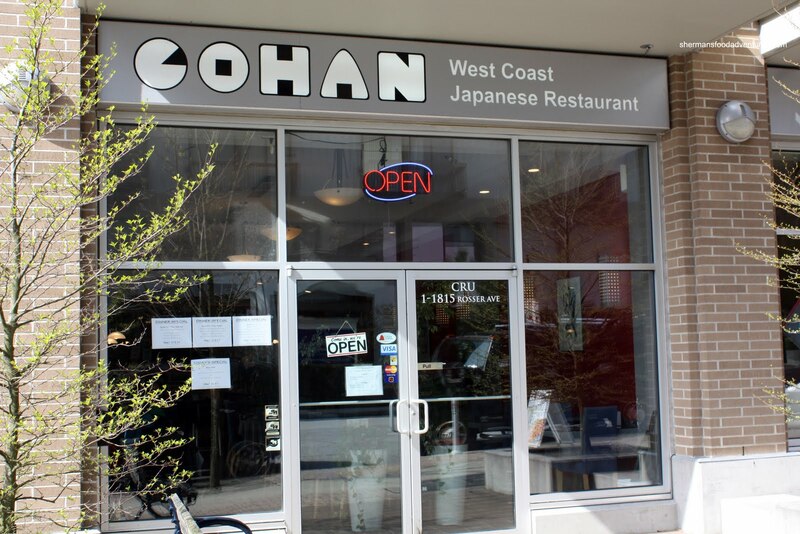 Gohan is an excellent restaurant. Next time, try the Chicken Karaage. It is fabulous. Lots of flavour because of a good marinade and it comes with a garlic cream sauce that works really well with it. No other restaurant I've seen has anything that comes close. And that salad dressing! Very tasty and another secret of the chef that works there. Kim, the food is good. Yah, the tataki is a good value, but as you said, it's a bit too big. Yup, Sushi Garden is a block away. But it's mostly quantity and value rather than quality. Gigi, LOL... Yah, the lunch specials are good! 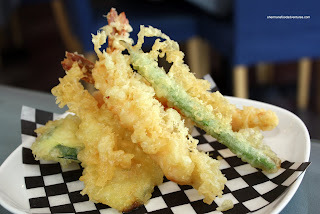 tanuki86, you are right, it is an excellent restaurant. Definitely hidden for most people! Thanks for the tip! Thanks for reminding me that we do have one local restaurant that features Hawaiian items. (There used to be an awesome plate lunch restaurant on Kingsway which has since changed ownership and which I miss very much). FYI, they have hawaiian kushi katsu and loco moco on their menu, very Hawaiian. Anyways, I'll have to go back soon so I can compare when I vacation in Hawaii this year. Also, you can park for free in the underground parking next door and drop by Winners for a little shopping if you have time. I also want to try their pressed sushi which is something I've never had.